What is a small multiple? "Illustrations of postage-stamp size are indexed by category or a label, sequenced over time like the frames of a movie, or ordered by a quantitative variable not used in the single image itself." In other words, small multiples use the same basic graphic or chart to display difference slices of a data set. Small multiples can show rich, multi-dimensional data without trying to cram all that information into a single, overly-complex chart. Small multiples go by many names, including Trellis Chart, Lattice Chart, Grid Chart, and Panel Chart. I would even argue that sparklines are a simpler, smaller cousin of small multiples. They allow for the display of many variables with less risk of confusing your audience. Trying to display three or more variables in a single chart is a challenge Stephen Few calls overplotting (PDF). The reader can quickly learn to read an individual chart and apply this knowledge as they scan the rest of the charts. 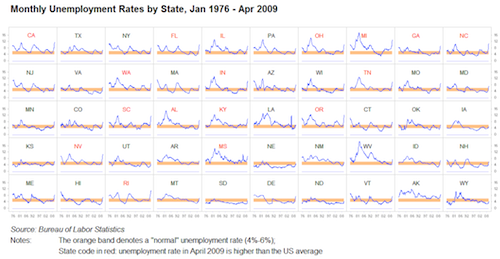 This shifts the reader’s effort from understanding how the chart works to what the data says. That’s a worthy goal in all data presentation. Small multiples enable comparison across variables and reveal the range of potential patterns in the charts. What to watch out for when using small multiples? 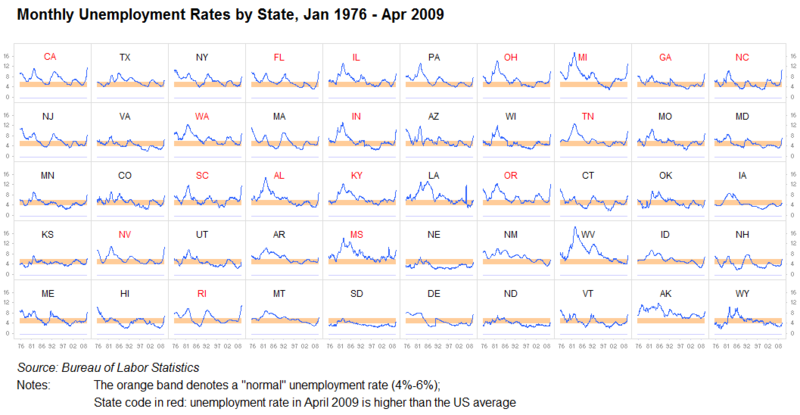 Placement of the small multiples charts should reflect some logical order, e.g. dimensional matrix, geography, or time. This helps the user quickly find the charts that are interesting to them. Small multiples should share the same measures, scales, size, and shape. Changing one of these factors undermines ability for people to re-use their understanding of the chart. Simplicity of the chart is critical. Users should be able to process information across many of these charts. 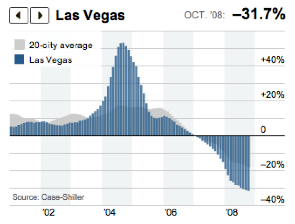 The following small chart from the New York Times works as an individual graphic; when shown in "postage stamp" size across 20 cities, this chart is too data-dense. Andrew Gelman’s analysis of public support for vouchers, broken down by religion/ethnicity, income, and state. 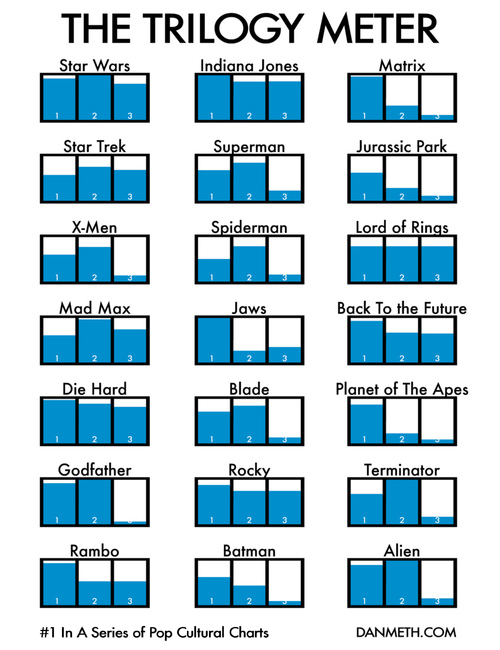 Trilogy Meter by Dan Meth shows movie enjoyment by sequel. Tableau Public. Nobody has small multiples more baked into their DNA than the folks at Tableau. Many Eyes for map-based small multiples.